Oh no! Kate has changed clothes mid Atlantic and is now in a dress! I cannot see if it is dark blue or black – I will wait until I hear, so hold your horses!! Right, the dress is officially navy blue and so the same people are through to the next round! Hmm! I see that Kate wore navy blue when the flight left London today. Presuming she does not change clothes mid Atlantic (! ), the following were correct with their guess : Joan Rigg, cjhurt2516, Karen Caddick, and Felice Ward. We need another question……OK, on July 3rd they go to Quebec, What colour will Kate’s shoes be? Answers to canada@jannettesrareyarns.co.uk by Midnight July 2 GMT. We took Jackson to the Cambridge University Hospital today as Joel telephoned and said they really did need to see what was going on in Jackson’s throat. We left him there and went shopping in Cambridge for an hour. When we went back Joel showed me the film they had taken of food progressing down his throat and I could see where it narrowed and the food had a job to get down. Joel said it did not need treatment at the moment as food was getting down – just rather slowly. So we are to take him back in 6 months for another check. He was weighed and has gained 500g. He is 4.2kg. I never want to see another ball of Wool/Cotton! I have finally finished sorting it – so many single balls in the same shade from different lots. Next I think I will do the last box of Big Wool. Now I must get on as I have been out for 4 hours and am behind! 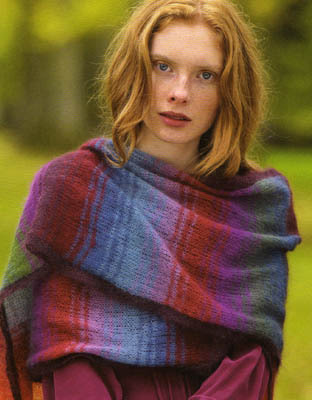 This wrap is in Rowan Magazine #50. I think it will be popular. Today I sorted the Wool Cotton odd ball box and have put half of it in my shop. It is not so hot today and we have had a lot of thunder. John has gone fishing with Kevin and won’t be back until late. I am going to take Slip for a walk in a minute and also water the greenhouse. I shall need to put over trousers on as the long grass in the field where we walk is very wet. Jackson was out all night and is fast asleep in his hammock at the moment. He won’t wake until ten tonight and then he will have a piece of cheese and set off on patrol. He always comes back at 7.0am and waits by the patio door to be let in. He gives a yell as he walks past our bedroom window to make sure we are getting up. I think he must have some sort of inbuilt clock! 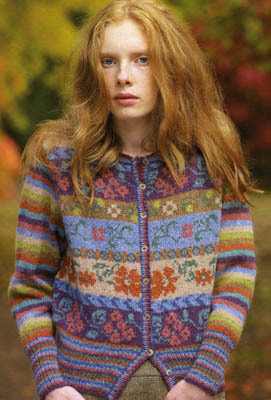 I thought you would like to see this rather nice cardigan that is in the new Rowan magazine. It is knitted in Felted Tweed. Today I sorted all the Calmer out and put it in my shop. It has been very hot and humid – not ideal for unpacking boxes of yarn. Now, a new contest! As you most probably know, Price William and Kate are going on a visit to Canada later this week. What will be the main color of Kate’s outfit when they land on their first day? The prize is a 3 pairs Addi Circular Needles ( either metal or bamboo) in the winner’s choice of size. Answers to canada@jannettesrareyarns.co.uk by Midnight GMT Wednesday. Now I am going to have a cool bath – I am roasting! Hmm! We went to the 3 Willows last night. I had crab and I have had an upset tummy all last night and today. I could not eat my roast pork lunch. I am so tired and drained. It is 9 pm here and I am going to bed. I will write again early tomorrow and start the contest then. I have waded through another box. Well, the top half which is 4 ply cotton. The bottom layer is Calmer which I shall tackle on Monday as I still have more 4 ply to sort out. We are going out to eat. More crab at the 3 Willows! Tomorrow I am cooking roast pork and making blackcurrant and raspberry tarts for pudding. Slip is having trout and Jackson will have his biscuits with a little salmon paste on top. I think John will go to Ireland again soon. I see he is checking weather conditions and river heights! Now I must go and wash my hair. Back tomorrow with a new contest.